This topic describes in detail how to develop a media player application using the NaCl Player API. The topic uses the Native Player sample application as an example. 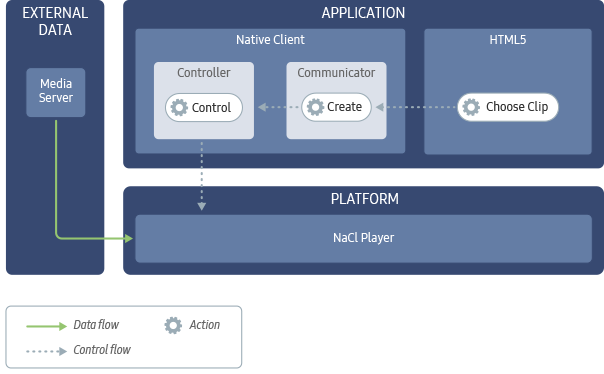 The Native Player sample application implements some of the main NaCl (Native Client) Player API use cases. The sample demonstrates the media data flow: data download, the demuxing process, and displaying the content on the TV. The sample application is designed in a modular and extensible way. Its source code is released under the permissive MIT license, allowing you to reuse and customize the code to meet your own needs. You can access the latest Native Player source code from the Native Player GitHub repository. This application uses API that is now deprecated. Use raw pointers instead of shared_ptrs. The NaCl Player API is used by the NaCl module. All player logic is implemented in the NaCl module, including user authorization, downloading and demuxing (parsing) media content, decrypting DRM-protected content, and passing demuxed elementary stream packets to the NaCl Player. Media server, which stores the media content. DRM server, which provides information needed to decrypt DRM-protected content. HTML5 component, which implements the UI and handles user interaction. The component has been omitted from the figure for clarity. Communicator handles communication with the HTML5 component, authorizing the user's access to the requested content. 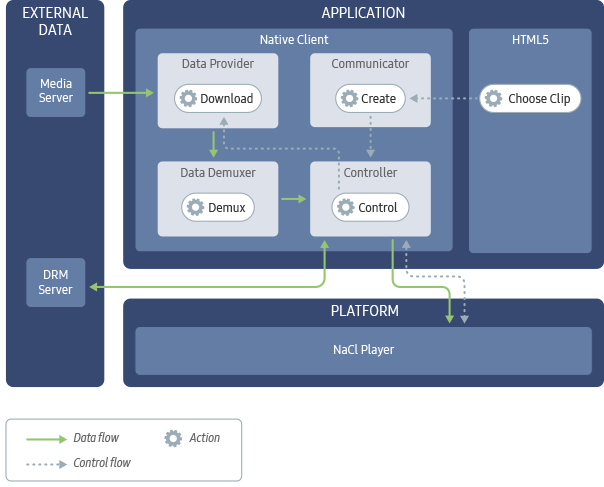 Controller interfaces with the NaCl Player by, for example, requesting data download and appending media packets to the NaCl Player. Data provider downloads external data in chunks from the media server. Downloaded content is demuxed into elementary stream packets. Clear content is not encrypted and can be parsed directly into elementary stream packets. 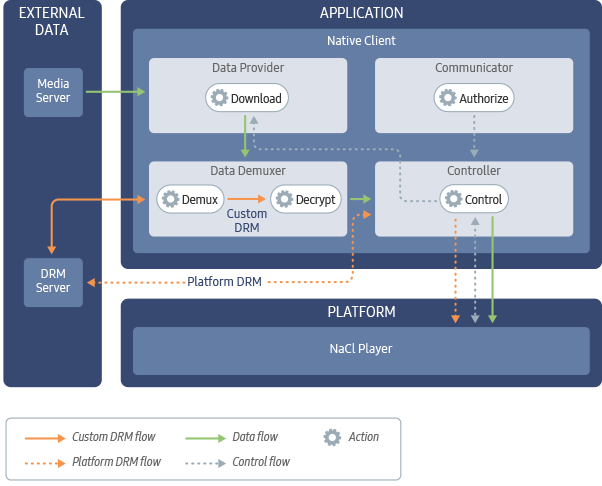 DRM-protected content is decrypted (custom DRM by the Native Client module, and platform-supported DRM by the platform). The platform contains the implementation of the player, which is responsible for performing the functions called by the application, such as decoding packets, playing audio, and rendering video on the screen. The sample application supports MPEG4 media playback from a URL data source, with external or internal subtitles. You can show or hide external subtitles, and you can show, hide, and select internal subtitle tracks. In this scenario, the platform is responsible for downloading and demuxing content. The application is responsible only for playback control, using the controller and communicator components. Implement the MediaEventsListener class to handle player and playback events. Register external subtitles to the player. During playback, the application receives SubtitleListener::OnShowSubtitle() events containing subtitle text and timing information. To display the subtitles, pass the subtitle event data to the HTML5 application component. In these scenarios, the application is responsible for downloading and demuxing content, and controlling the media player. To play MPEG-DASH content, the DashManifest class uses the libdash library to parse a DASH manifest file and download the appropriate media file or media chunk. The DashManifest class is also responsible for extracting Content Protection DRM initialization information included in the DASH manifest, through the ContentProtectionVisitor class. In the sample application, the "src/dash" directory contains the data provider implementation. In the sample application "src/demuxer" directory, the FFMpegDemuxer class implements the StreamDemuxer interface. The StreamDemuxer interface supports clear and encrypted elementary stream content. It demuxes the media content into elementary stream packets. The FFMpegDemuxer class uses the ffmpeg library. It extracts the elementary stream configuration and protection data, such as PSSH box and DRM initialization data, from the media content. The parsed packets are delivered to the application using the es_data_callback_() function, which was registered during the StreamDemuxer class initialization. In the "src/player/es_dash_player/es_dash_player_controller.cc" file, initialize the DASH parser. The application must handle DRM configuration. Because DRM-specific data is not part of the DASH standard, it cannot be parsed by the libdash library. The DRM-specific data is stored in the ContentProtection DASH manifest section. The ContentProtectionVisitor class passes the DRM-specific data to the DashManifest::ParseMPD() function. Initialize a video stream from the DASH manifest. Audio streams are initialized in a similar way. In the "src/player/es_dash_player/stream_manager.cc" file, initialize the StreamManager object. It manages elementary streams by downloading the appropriate representation, demuxing it into elementary stream packets, and sending the packets to the player for playback.